Over 1100 Times Slower is... Bad! This posting is focused on parse time when there is an intense load that completely consumes all the available CPU combined with massive library cache mutex related contention. I should also note that the load placed on the system is not from the SQL statement under observation but from other SQL statements (detailed below). As one would expect, my previous posting documented that my experiments showed hard parsing elapsed time took 180 times longer than soft parsing and over 1100 times longer than softer parsing. But again, that was in a no-load situation in a pretty serial-like situation. This experiment and posting interjects competition for serialization control structures and for CPU resources. In summary, I gathered the elapsed parse time when a statement is executed; once, twice, ... seven times. However, I also injected an increasing load so we could see the impact of a load on the initial hard parse (execution one) and the soft-type parses. The strange looking sleep time determination above creates a much more realistic sleep/think time. I detail this in my May 2012 posting entitled, Creating Realistic Think Times for Research Projects. Opening the cursor forces a parse to occur requiring serialization control via mutexes (cursor: pin S). Just to double check, I SQL traced a very simple open and close, clearly revealing there was indeed parse time related to the open and close. The above script rtpctx.sql comes from my free OSM toolkit. The "% RT" column is the percentage of time related to the total CPU and non-idle wait time over the interval (38 seconds in this situation). The "% WT" is the percentage of time related to all the non-idle wait time over the interval. You can see the wait event "cursor: pin S" was 99.36% of all the non-idle wait time and 63% of all the CPU plus wait time. 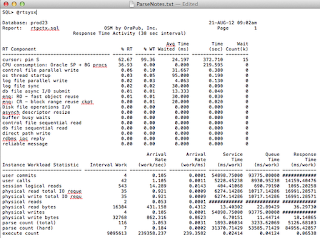 And as you might expect, the 6 CPU cores where averaging 100% busy! The experiment was run at 10 different load levels, signified as level 3 to level 13. (At load level 1 and 2, nothing much was happening.) The load level is a relative term. Each load unit is related to 7 concurrent sessions each with a different sleep time (see code above). About the SQL under observations: At each load level a similar yet unique SQL statement (different objects but otherwise exactly the same SQL) was run seven times; the first is the hard parse, the second is the soft parse... At each load level and for each of the seven execution times, I took 100 samples. Not 30, but 100! I gathered 30 the first time, but when I created a few histograms they looked really interesting, so I decided to gather more samples. Because the SQL statements execute so quickly, gathering all the data only took around an hour. This experiment generated interesting plots, histograms, and numerics. Everything has been placed on-line for you spend countless hours analyzing. However, I will highlight just a few things below. If you want to look at the experimental details; including all the scripts, output including the data, plots, Mathematica notepad, etc. click here (3.6 MB). I'll report my findings through a series of questions. Does hard parse time increase as the load increases? Yes, but it's even more interesting than you might think! First, remember the load on the system was competing for CPU resources and hard parsing requires CPU resources. If there was an IO bottleneck, the hard parse time might not increase as the load increases. 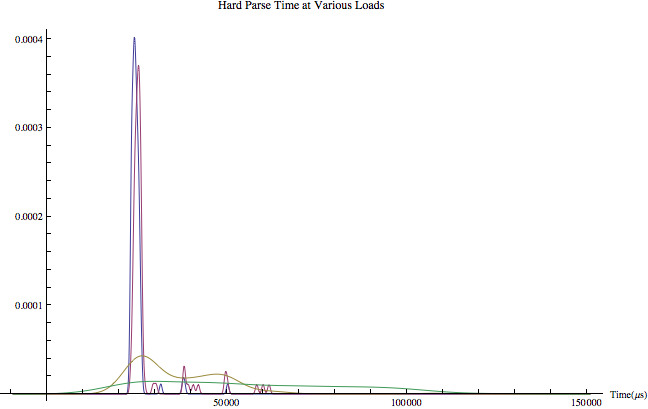 Here is a plot which clearly shows as the load increases, so does the hard parse time. Each dot (and many are stacked) represents one of the 100 samples taken at each load... for the initial execution, that is, the hard parse. For example, at load 3 while it may look like there are only perhaps five samples, there are actually 100... not a relatively large variance or data spread. 1. Hard parse elapsed time increased as the load increased. 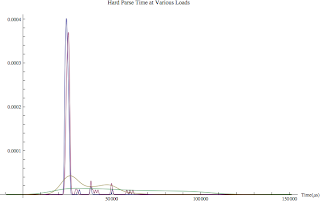 Once the load level hit 10, CPU utilization averaged around 100% and 99% of the wait time was cursor: pin S. Here are the median elapsed parse times (ms) starting at load level 3: 24.5 , 25.5 , 31.3 , 55.3 , 81.0 , 76.4 , 132.1 , 140.0 , 152.0 , 134.2 , 190.5 . 2. Hard parse elapsed time variance increased as the load increased. The plot above clearly shows the spread of sample time increases as the load increases. It's actually much more than I expected. Keep in mind, that because the samples can overlap, looking at the above plot it's not possible to get a good understanding of the distribution. For that, we need a histogram as I show below. The two tall above smoothed histograms are the hard parse at Load 3 and Load 4. They are so tall because their spread is relatively small so most of the samples end up being stacked on each other. Load 5 peaks far below Load 3 and Load 4 but does have a peak (i.e., mode). Load 5 and Load 6 are tremendously spread out and are barely visible. The spread was massive for Loads 7 to 13, I did not show them in the histogram. Large data spreads produce inconsistent performance... something that users do not enjoy. 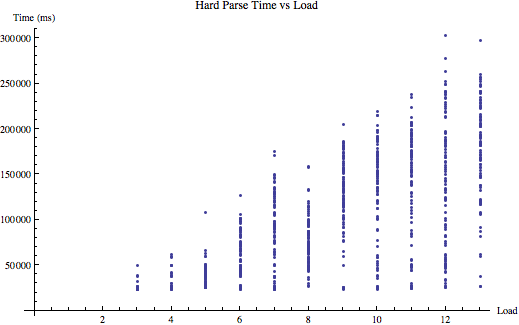 I also wanted to know if the relationship between hard parse elapsed time to load is linear. All the needed data is in the Mathematica notepad, but looking at the plot below we can see the relationship appears to be linear. 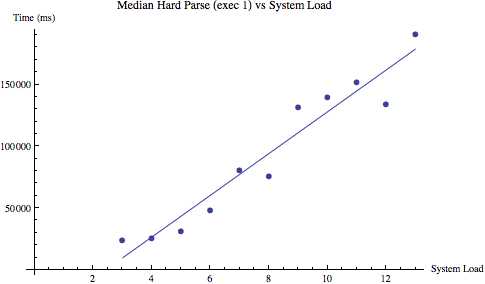 The relationship between hard parse elapsed time and system load appears to be linear. Certainly there is not an exponential-type bend to the curve. 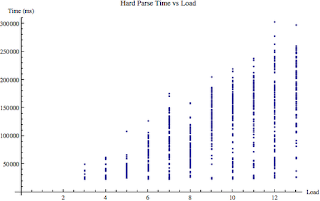 I incorrectly assumed that as the load increased the hard parse time would increasingly increase resulting in a non-linear relationship between hard parse times and load. Here's the plot. 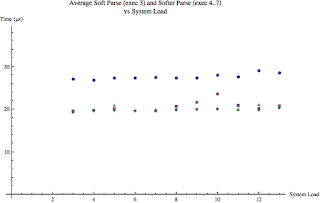 Is there is significant difference between hard, soft, and softer parse times at the various loads? Yes. Below are the plots clearly demonstrating this! Going left to right and top to bottom, the upper left plot are the elapsed parse times for the initial parse (hard) at various load levels. And yes, this is the same chart at the one above. 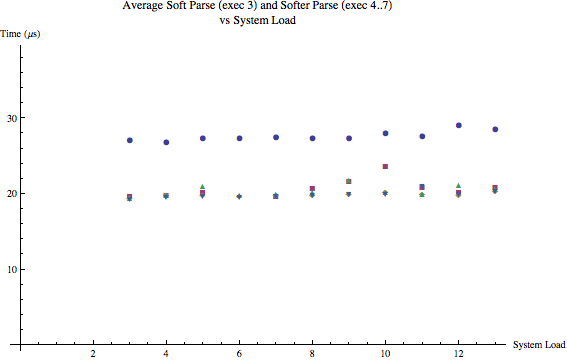 The bottom right plot is the seventh parse (very soft) at various load levels. 1. 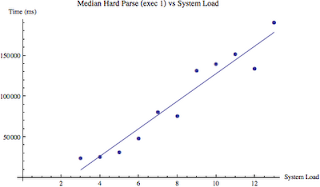 The hard parse is always much longer than a soft parse, regardless of the load level. In fact, here are the median hard parse times (ms) at load level six: 48.7 (hard), 0.142 (soft), 0.026 (soft), 0.020 (softer), 0.020 (softer), 0.020 (softer), 0.020 (softer). At load level six, the difference between the hard (first execution) and soft parse (second execution) is 348 times! (348=486.8ms/1.4ms) In my previous posting related to a no-load system, the difference hard parsing was 180 times longer than soft parsing (second execution), so a load definitely accelerates the situation... about double in this situation. 2. At load level six, the difference between the hard parse and the softer parse (execution 4, lower left plot) is 2435 times! (2435=48.7/0.020) In my previous posting related to a no-load system, the hard parsing was 1129 times longer than softer parsing (fourth execution), so a load definitely accelerates the situation... about double in this situation. When does the elapsed parse time stabilize? 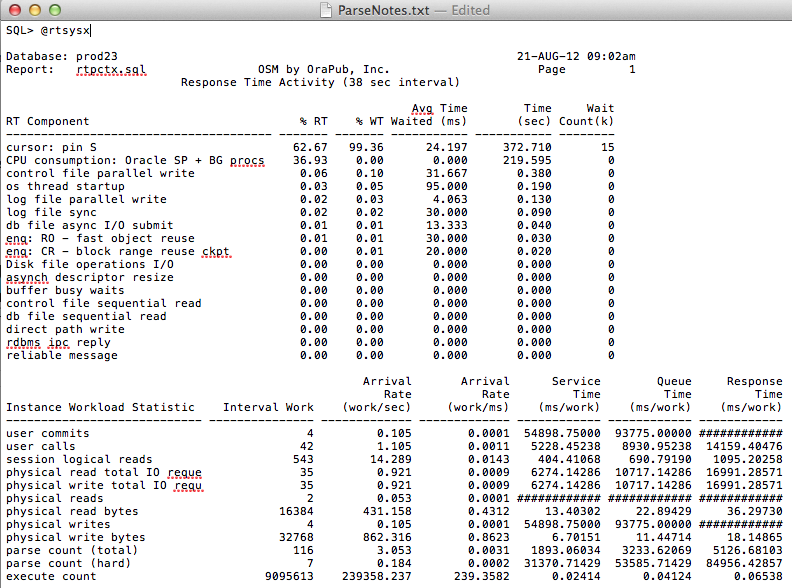 The fourth execution is about the best Oracle can do in terms of elapsed parse time. While there are significant drops from the first (hard) to the second (soft) parse and also from the second (soft) and third (soft) parses, once the fourth execution (softer) occurs the parse time stabilizes. 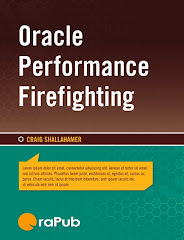 This is exactly what we saw during the no-load experiment and demonstrates the the session cached cursor performance is the best Oracle can do. This is why we don't continue to see a parse time drop when comparing the fourth to the fifth, sixth, and seventh executions. In the above plot, the third execution (soft parse) elapsed times are the top round blue circles. The fourth to seventh executions are clumped together fairly consistently below the third execution soft parses. Is soft(er) parsing elapsed time immune to the system load? Yes, in my specific experiment. If you look at the above plot and one above it (with the seven plots), you'll notice that the elapsed parse time is very consistent and did not increase much (it does a little) as the load increased. The obvious exception is the hard parse. This is another example of why we want soft parsing to occur and just how performance harming hard parsing can be. 1. Hard parsing elapsed time increases as the (CPU) system load increases. That is, it gets worse and worse! While the relationship is linear, in my experiment hard parse times increased from around 25 ms to 190 ms. That is around a 7.6X increase or if you prefer, a 760% increase! 2. By sharing SQL, Oracle is able to soft and softer parse dramatically decreasing parse time, reducing CPU consumption, and reducing memory serialization control issues (e.g., mutex wait events). At an intense CPU workload (load 6), the parse time drop from a hard parse (first execution) to a softer parse (fourth execution) was around 2435 times! Note: There are rare and very specific situations where we want a similar SQL statement to be slightly textually different reducing the likelihood of many sessions executing the same exact SQL statement. I will focus on this in a future blog post. 3. Once a statement is executed four times, parse time is unlikely to decrease any further and is not materially affected by the CPU load. In my next parsing related posting, I am going to delve into the situation where hundreds and hundreds of child cursors can be created causing massive serialization and parse time issues. If you're not familiar with this situation it can seem obscure and unusual. But it occurs more often than people think and can be a very serious performance issue. As always - I really enjoy your work and articles. Hard parse vs soft parse is a matter of using binds or not. In my experience developers most often use binds. One of the areas where I sometimes see that developers "cheat" is when doing queries with varying IN-lists (where the number of values in the IN-list vary). Developers seems to think "well I'm using binds every where else ... it can't really hurt if I don't use binds for these IN-list values". Well - if this is a query being run frequently, it could really become a bottle neck in your system, preventing your system from being able to scale. Many Java developers use Hibernate (API for mapping objects-model to relational modell). Hibernate takes care of the generations the SQL statements sent towards the Oracle database. The way Hibernate treats varying IN-lists might also become an issue. Soft parse vs softer parse is actually a matter of using PLSQL or not. Using PLSQL, oracle could keep your cursor open for you, skiping the need for do full soft parse (but it's still a soft parse). This functionality is set by the SESSION_CACHED_CURSORS parameter. The last discussed topics was the no parse vs soft parse. This is basically a design issue, keeping the cursor needed open for as long as you need it ,then close it. It also worth mentioning that hard parse is not evil per se. Queries run infrequently will probably be flushed from your shared pool, and need to be hard parsed if you like it or not. This single hard parse will probably not become a performance issue. Hi again. Hope everything is ok with your familiy. Missed your presentation at OpenWorld, but hopefully I get a chance to see you present again another time. One think I did pick up at the OpenWorld is that you actually have another category of parses, introduced by the 11g feature Adaptive Cursor Sharing. This is the "harder" soft parse. This feature indicate that Oracle has to bind peek on every parse, and look through all the child cursors for a match.